Why Would You Buy Berkshire Hathaway? Earlier this week I pointed to the fact that there is little or no reason to ever own Berkshire Hathaway? Why would you even bother? Since making these comments, the twitterati and financial bloggers in multiple languages around the world have been weighing in. People are surprised as to how correlated Berkshire has become with the S&P500. As smart and brilliant as Warren Buffett might be (I have no idea, I’ve never met the guy), he’s a closet indexer. The truth is, I was surprised when I ran the numbers. I couldn’t believe how irrelevant that stock has now become. It started with a simple phone call from a friend of mine, we’ll call him “Uncle Pat”. He was asking me for some advice on how to approach a client of his who won’t send him any more assets because he’s doing well on his own – apparently he has his entire portfolio in Berkshire Hathaway. Uncle Pat is a financial advisor and just looking to grow his business like anyone else. I left that industry years ago to launch my own hedge fund, but I still remember dealing with this sort of nonsense. I told Uncle Pat that I’d run the numbers for him because I was pretty sure the only reason his client was doing so well was because Berkshire is probably pretty closely tied to the ups and downs in the US Stock Market. Boy was that an understatement. As it turns out, the Berkshire Hathaway A-shares have a +0.98 correlation with the S&P500 over the past year. It has a +0.95 correlation over the past month. 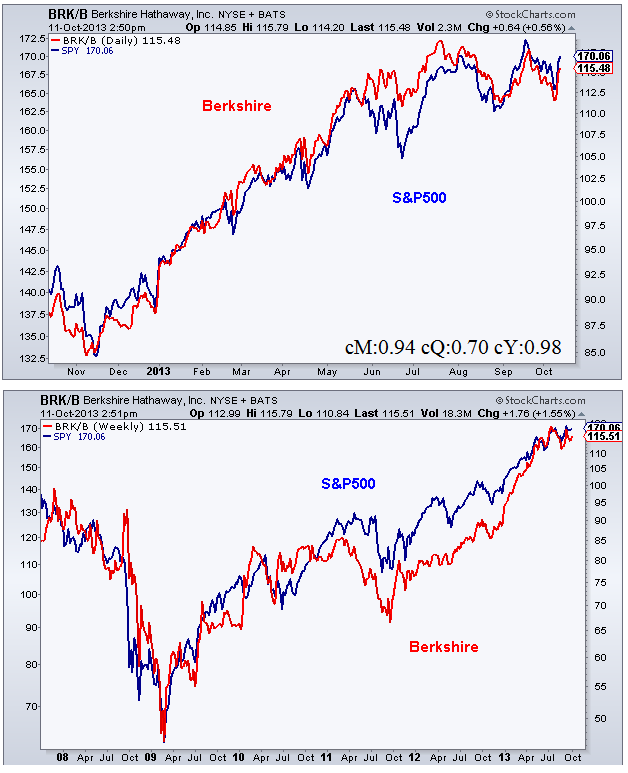 Just to put things in perspective, Berkshire has a higher short-term correlation to the S&P500 than the Dow Jones Industrial Average has to the S&P500. You can’t even make that up. So why on earth would you ever bother “diversifying” your portfolio by adding another extremely correlated stock to the mix. All you’re really doing is adding exposure, volatility, and risk to your portfolio by adding Berkshire to an already highly correlated stock portfolio. Talk about a waste of time, money and energy. But the bottom line? Don’t waste your time investing in a closet indexer. Just go buy $SPY for $8/trade on e-trade or something. And if you want diversification, which most of us do, run the math first and make sure you’re not just adding to exposure that you already have. We look to other asset classes for this like bonds and commodities, and if you look hard enough, you’ll find some great stocks with little or no correlation ($AAPL is actually one of those). So if your broker or advisor thinks it’s a good idea to give Warren some of your money, send him the math and tell him how silly that would be. I was just as shocked as you, trust me. But now we know. And knowing is half the battle.